S. S. ENGINEERING introuduces the most sturdy, heavy duty SIGMA MIXER for trouble free long term operation for various application like mixing, kneading, grinding, dispersion, drying etc. SIGMA MIXERS have application to process Viscous to highly Viscous material in various industries viz. Adhesives, Broke lining, Chemical, Confectionery,Carbon Black, Ceramic, Dyes & Pigments, Food Products, Fibre Glass, Grease, Lead Storage Battery, Megnetic Tape Coatings, Paint, Polymers Plastic, Putties, Plastic, Pharmaceuticals, Printing ink, Resin, Rubber, Soap & Detergent etc. SIGMA MIXER consist of “W” shaped container made of either Mild Steel or Stainless Steel 304 or 316 with jacket of Carbon Steel covering two side for heating or cooling application & dust free cover to get Vacuum if desired or normal cover. The mixing elements (Blades) are of Sigma type Steel casted and duly finished two in number which contra rotate inward fitted at close or specified clearance with the container to give thorough and uniform mixing. There is a Gland pusher of Gun Metal Bush which ensure minimal friction and extend the life of mixing elements (Blades) Shaft. 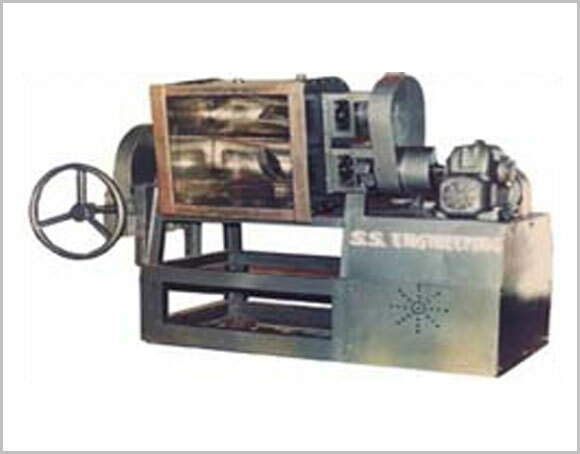 The Drive Consists of Motor of type TEFC Or TEFC Flameproof of Specified HP.1 440 RPM, Reduction Gear Box Of Reputed Make having suitable size and ratio, Spur Gears, are also provided of adequate size and having machine cut teeth, between the front and rear blade complete with guard suitable for grease lubrication. The complete Mixer is Mounted on Steel Fabricated stand of suitable strength to withstand the vibration and give noise free performance.